Templates to print on fabric or paper for Lucy Boston Patchwork of the Crosses (POTC) quilts. NEW! This shape collection was expanded in May 2014. See the details on the All About Inklingo blog. This Inklingo PDF includes the hexagon and square for Lucy Boston Patchwork of the Crosses—POTC—plus several extra shapes. POTC blocks are made with only one shape—the hexagon—and the blocks are linked with squares. The shapes are the same size as the original by Lucy Boston. There is also a larger size (note below). The magic of Lucy Boston's design is in the creative use of fabric, especially "fussy cutting." A few shapes in each block are fussy cut and you can fussy cut with Inklingo (video). These unusual shapes are included for a straight edge on the quilt (below). Squares and Quarter Square Triangles (QST) are an added bonus. These hexagons are sometimes called honeycombs. Unusual partial hexagons (which are not half hexagons) are perfect for a straight edge. This Inklingo download includes many shapes, but not a pattern or sewing instructions. 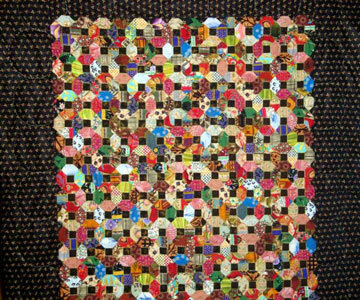 Lucy Boston Patchwork of the Crosses (book-on-paper) includes wonderful photographs of the original quilt (including a centerfold of the whole quilt) and a detailed pattern. Save $5 when you buy the book-on-paper and the shape collection at the same time. You can see close-up detail of this wall hanging on the Inklingo Facebook page. The shapes are the same size as the original by Lucy Boston. There are 3 other Inklingo downloads with other sizes. See the size comparison in the free PDF (below). Jutta in Austria used this Inklingo Shape Collection to make her spectacular Aunt Clara Quilt top. It uses the same shapes, but it looks completely different from the Patchwork of the Crosses. Don't you love Jutta's dazzling use of color? I do NOT recommend English Paper Piecing for POTC. The brilliance of Lucy Boston was in the way she used the designs in the fabric, not her sewing method. It is much easier to print the shapes on fabric with Inklingo (TWO methods of fussy cutting) and sew with a running stitch. Quilters tell me they can start and finish 3 or 4 POTC blocks with Inklingo in the time it would take to make ONE with EPP.